Aimlessly blogging about landlord life since 1719. No nonsense! You are here: Landlord Blog » Landlord Articles » Landlord Tax Advice, Finances & Saving Costs » Online Will Services, Are They A Legitimate Solution in 2019? 97% of Brits don’t have a will or have one that’s outdated! That means there’s a good chance that someone we despise could end up with our life’s work, or even worse, leave it in the hands of the law to decide who gets what! This is a follow up from a blog post I recently hashed together, where I explained how I was prompted to write a will after being convinced by fate to do it, which includes heroically conquering a near-death experience. Thankfully by the grace of God, the dislocated pinky-finger I picked up during a game of basketball didn’t lead to my demise, but it was a close call, so I lived to tell the tale. As I said at the time, the experience of dislocating my finger, which lead to momentarily watch the light at the end of my tunnel fade, had a profound effect on me. It made me realise how fragile life is. Moral of the story: You just never know what fate has in store for you. One day you can be on top of the world after winning a tenner on a scratchy, the next you can trip over a soggy condom and have your lights taken out. So live like you have nothing to lose, but plan for the day you lose everything. While 99.9999% of the content on this website is related to property and landlording, I’m going to take one of those rare moments to derail. This blog post still be wholly relevant to anyone that owns property, but it will also be ideal for anyone that wants to make sure their money, property and possessions are allocated as desired after their passing. Quick analysis – are Farewill’s wills legitimate? What happens if you don’t create a will? Conclusion: do I recommend Farewill? In my recent blog posted, I mentioned that I used an online solution to write my will, Farewill.com. I gave a moderately detailed analysis of my experience with using them, and in return I received a lot of perked interest from other people that wanted to get in on the action. So I’ve decided to throw together an official review with further details, which covers the pros and cons of using Farewill, and what convinced me to go with an online solution. Before being made aware of Farewill, the idea of writing a will online was completely alien to me (even though the service has been available for a while now). I didn’t even consider an online solution was an option; I had this preconceived conception that our options were limited to either personally writing our will on a scrap piece of paper (and hope it’s clearly laid out, which it often isn’t), or the more reliable (and expensive) method of going one-on-one with a professional solicitor. Apparently I’m officially a fossil, because times have changed. Much like everything else these days, you can do it online. If you’re looking for the short answer, yes. If you were also in doubt, and just after quick reassurance from a real-life guinea-pig that’s used Farewill’s service, then here it is: yes, you can legitimately use an online company, like Farewell, to create a legally binding will relatively quickly and cheaply! And an awesome solution, it is. However, technically speaking, it’s not difficult to create a legally binding will. According to the GOV UK website, you can write your will yourself, and as long it’s formally witnessed and signed (but not by the beneficiaries), it’s legally valid. That in itself is easy, but laying out the will so it’s easy to interpret and ensuring all the bases are covered (i.e. making provisions in case one of your beneficiaries dies before you do) is another art form altogether, which is arguably the main reason for using a specialist service. Quick – honestly, it’s so incredibly quick to create a will using Farewill’s website- they’ve done a great job on that front. The process was pretty effortless. Actually, it almost felt too effortless. Assuming you have all the details of your assets at hand, and the names and contact details of your beneficiaries and executors, it shouldn’t take more than 15mins – the same amount of time they say it should take in their marketing sales-pitch. That’s how long it took me anyways, give or take. Cheap – a typical lawyer charges anywhere between £200 – £500 to write a will, and the cost escalates if you make updates along the way (which is only the natural thing to do as circumstances changes, otherwise you’ll fall into the 97 percentile of people that either don’t have a will or have an outdated one). Farewill charge £90 for a single will and £135 for a couple, and an optional subscription of £10 per year if you want the ability to make unlimited updates as and when you please (more on the pricing explained below). Incredibly easy to use – this is where Farewill steals the show, especially when compared to their online rivals. Yes, there are a few other websites that offer the same service. But the conclusion of my brief investigation has lead me to believe that no one makes it quite as easy as Farewill. They’ve cobbled together one very slick website. It’s incredibly peaceful to create a will with their online dashboard- from adding the beneficiaries and executors, to adding all your assets and clarifying who gets what. The clear flow of the process and ease of data entry is truly refreshing. Dare I say, it would be a stroll in the park for even a monkey. Pay after – they don’t make you pay until you have added all the details of your will, which I think is a very nice touch for one primary reason – it means that if you find the process too tedious, complicated or unsuitable for your needs (I doubt the average person will find any of those to be the case), then you have the freedom to abandon ship without spending a single nugget. No obligations. Save & continue later – you can treat the creation of your will kind of like a mini-project, because before paying for the service, you can save what you’ve done and continue at a later date. Useful if you gather the information you need in stages, which is entirely likely i.e. gathering contact details of beneficiaries and executors. But obviously, don’t leave it too long – because you know, we don’t know what’s happening tomorrow. Not that I’m trying to tempt fate, or anything. Support – they have a live support and contactable telephone number if any assistance is required. Disclaimer: I didn’t need to use their customer support, so I can’t comment on how good it is. However, the fact that it’s available is nice. Updateable – You have the ability to update your will and reprint it for signing. In many cases, wills need updating so it’s a useful feature. Circumstances frequently change, which may include amending your beneficiaries or executors, or if there’s a change to your assets. TrustPilot – at the time of writing this review, Farewill have a TrustPilot rating of 10/9.6, which is impressive. Naturally, I scoured through the reviews before deciding to use them. Not suitable for complex estates – I’d honestly say this point applies to ALL ‘quick & easy’ online will services, and not just Farewill. I personally wouldn’t recommend using Farewill or the alike if you have a particularly complex estate, which may include leaving behind a business or co-owned property with a feuding co-owner, or complex situations with spouses. Most people won’t have complex estates, so an online solution will be suitable. However, in complex cases I’d recommend going to a specialist will solicitor for professional guidance. Inheritance tax advice – similarly to my above point, if you’re concerned about burdening someone with inheritance tax, I’d recommended seeking professional advice from a tax expert before writing your will. They’ll be able to assist with keeping inheritance tax to a minimum, while online solutions like Farewill won’t be able to provide such guidance. Spam box – perhaps I’m knit-picking, but this was a genuine issue for me, so in order to be completely objective I feel I need to document even the most trivial elements of my experience. My confirmation email (which stated whether my will had passed their internal inspection) was sent into my spam/junk box, so when I didn’t receive it with in 5 days, I started getting a little antsy. It turns out the confirmation email was sent with in 48 hours of creating my will and paying for it. So yeah, check your spam/junk folder for the confirmation email if you decide to use their service! Their pricing structure may cause some confusion on the surface, but once explained it’s easy to digest and it makes perfect sense. 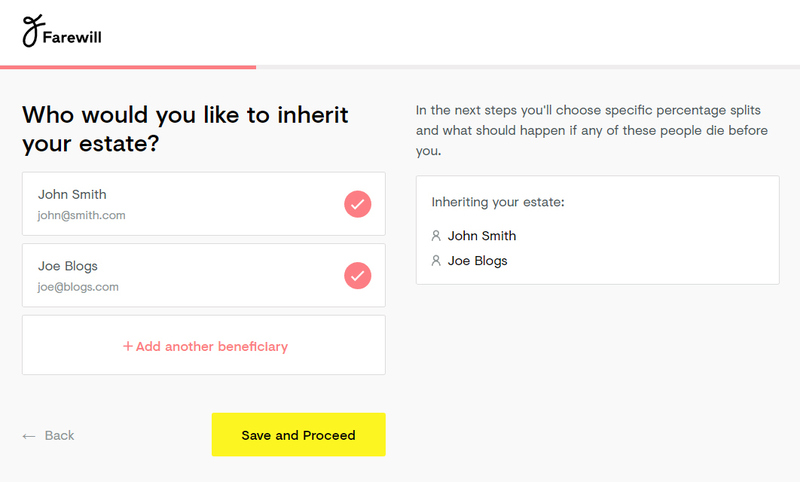 After creating and paying for your will, you are automatically signed into an annual subscription of £10 per year, which permits you to make unlimited updates as you need (as explained before, a very useful feature, particularly if you want to keep it updated as your circumstances change). You can cancel any time (easily via your personal control panel), but then you’ll have to pay the full amount again if you wish to make changes in the future. Your first year of updates is free, so diarise if you want to cancel before the subscription fees kick in. I’m personally going to remain subscribed to their update service, because I frequently transfer money into different savings accounts to benefit from the best interest rates, and in my will I’ve specified which accounts my money is held in. Here’s a downloadable sample Will by FareWill. Just so you know what to expect. The main problem with the D.I.Y approach is that isn’t all that easy to do properly if you don’t have a simple affair. Many people open up a blank Word document and attempt to write their own Will… and then monstrously struggle to clearly explain how they would want their estate to be distributed in a clear and concise manner. An online solution will ask the right questions and then format it properly, with the correct terminology. That said, one method isn’t any more legally binding than the other. However, one could definitely be more confusing and hard to interpret than the other, which could easily lead to problems. But more importantly, if errors are made, the document could be invalid, which is more likely to occur when writing your own will. While a solicitor is definitely more suitable for complex estates, they generally aren’t suitable for most average people with simple solutions, consequently, many people are overpaying for a service they don’t necessarily need. Putting the obvious cons of using a solicitor aside for a moment, which includes the extra cost, time required and the inconvenience of going to a solicitor, let’s take a look at arguably the most important factor: which produces the best final product. According to this article on legalwills.co.uk, a shadow survey revealed that there were just as many errors in solicitor drafted Wills as there were with online services, so the final product may not be lower in quality to a Will and Testament written by a solicitor. That said, at least with an online service they can amend any oversights, and assuming you’ve opted for the update subscription, you can quickly and easily plug any holes by downloading newer versions (i.e working/format updates provided by Farewill). 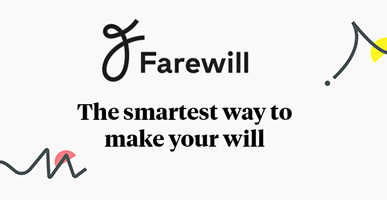 Finally, I want to recall on a point I covered when I was discussing the pros of using Farewill- where I mentioned that they don’t require you to pay until you have added all the details of your will, which doesn’t have to be done in one afternoon, because they allow you to ‘save and continue later’. Try getting that level of flexibility with a solicitor (without incurring hourly rate fees). I’ve seen a few Will Kit’s and templates circulating, notably one from WH Smiths. Incidentally, WH Smiths also provide tenancy agreement kits for landlords (which, after analysing, I’ve been happy to avoid). The cons of using a Will kit over an online service are similar to writing your own will, only perhaps with a smaller margin for error – but perhaps not as small as you’d like to imagine for a paid solution. It’s can be difficult to make updates without buying a new KIT; many people amend the same will in hand-writing, and constantly move figures and names around, which can quickly become messy and difficult to read. There is no error checking by a will expert. Most kits don’t have an “alternate scenario” provision. For example, what happens if your main (or only) beneficiary pre-deceases you. I can’t speak for all online services, but Farewill neatly allows you to make provision for those cases. Finally, let’s compare the price differences: the DIY kit by WH Smith is £16.99. For 30 odd quid extra, I’d say it’s worth splashing out for an online service – with the option to make updates online and reprint. As said, there are several main Online Will service providers, which includes LegalWills.co.uk and TenMinuteWill.co.uk, and some of which are cheaper than Farewill. However, none of them made it look as easy and clean as Farewill in my opinion, which was the deal clincher for me. But of course, I encourage you to shop around if you’re in the market. Unfortunately, dying without leaving a will is incredibly common, and it’s the root cause of many family disputes and expensive legal battles. If you’re not married or in a civil partnership, your partner won’t be entitled to anything. If you’re married, your spouse might inherit most or all of your estate and your children might not get anything (except in Scotland). This also applies if you are separated but not if you’re divorced. If you have children or grandchildren, how much they are legally entitled to will depend on where you live in the UK. Any Inheritance Tax that your estate has to pay might be higher than if a will was left. If you die with no living close relatives, your estate will be passed to the Crown. This law is known as ‘bona vacantia’. Err… on that note, it’s probably an impeccable idea to sort out a will. Pronto! Assuming you have a relatively simple estate: 100% yes. I can’t emphasise how easy they have made it. If you’ve used Farewill, or any other online will service, I’d love to hear your experience. I hope this review has been somewhat useful!